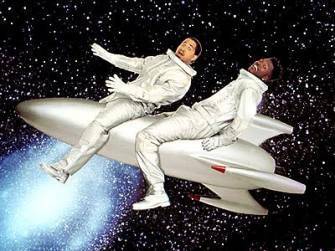 WHIT SPURGEON: My editor wanted me to ask you up front, Kevin, if we can expect a Homeboys In Outer Space reunion? KEVIN MICHAEL RICHARDSON: [laughter] Tell him I don't think so! [laughter] You know what, I might do it! [laughter and coughing] I might do it if it was a... [laughter]. It all depends. James Doohan has passed away, so... Oh God, and Flex [Alexander], I bumped into him. Who knows, man? You know what? If somebody approached me about it and said they want to do it, and the money was good, that's a very strong possibility. WHIT SPURGEON: Hey, made for TV movie! RICHARDSON: That's brilliant, that's brilliant. Just when you thought you forgot, they pull you back in! Oh, that's funny. WHIT SPURGEON: I was stunned that there were 21 episodes of Homeboys. RICHARDSON: Yeah, you know what, you're right, I can't believe that, I didn't know that they'd made a whole season. A couple of them are out there, and I have no idea where they are. WHIT SPURGEON: I was checking you out on IMDB today. Reading your IMDB profile is exhausting. You've got more credits than Wallace Beery. RICHARDSON: I don't know who puts it up there. I think there might be a few of them that are inaccurate. There's another Kevin Richardson in the union. But I did oversee it at one time a little while ago, because I really don't look at it often, and yes, most of them are me. Yes. Absolutely. There's about two or three where I go, "Well, I never did a Living Single," or something like that. "That wasn't me." But, yes, 99.9% of them? Definitely. I do get around. WHIT SPURGEON: You've had a hell of a voiceover career in particular. RICHARDSON: It's good, it's been good. It's Tourette's and schizophrenia, really. You're just going "BLBLBLBLBLBLBL!" behind the microphone. It's basically left-brain. It's just rambling. 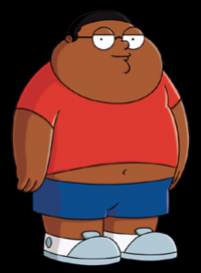 WHIT SPURGEON: I read something about you getting Cleveland Jr. [on The Cleveland Show] because you were doing another voice for the show and they said, "Kevin, can you come in here and give us your take on this?" RICHARDSON: Right, right -- they'd cast me as Lester first. WHIT SPURGEON: And which one's Lester? RICHARDSON: Lester Krinklesack [Spurgeon laughs] is the redneck neighbor that lives across the street. WHIT SPURGEON: With the 500-pound wife. RICHARDSON: Yeah, Kendra. [In Lester's voice] "Yep, that's me! And this is my wife." [resumes normal speaking voice] They didn't even think about me for Junior. But they said they weren't having too much luck, so they called me in. We were in there in the booth. Seth [McFarlane] and Mike [Henry] and Rich were in the room, and they said, "Kevin, what would Cleveland Senior sound like as a 12- or 14-year-old boy?" So I incorporated that with the voice I did for ER when I played Patrick -- he had the football helmet, was mentally challenged? RICHARDSON: So I used that voice with him, and that's how we got [in Cleveland Jr. voice] "Daddy, will you wipe me?" [resumes normal speaking voice] You know, that kind of voice. WHIT SPURGEON: I feel like some childhood memories may have also been involved in that. RICHARDSON: Yeah, yeah. Yeah! (Laughs) Ay-yi-yi! WHIT SPURGEON: How did you break into voiceover? RICHARDSON: I had a commercial agency, CESD, a talent agency out of LA. I was with them in New York, so I became an affiliate when I moved out here -- to LA in '91, not San Diego; LA. I found out they had a voiceover department. This was when it was reel-to-reel, and not digital like now. They were like editing the voiceover auditions, and I heard this character. I stopped and said, "What is that?" And they, at the time, Donna Davies, God Bless her, she's passed on, said, "Oh, this is our Voiceover Client Demo." I go, "What?" "You know, our demo." I said, "You mean like animation and voices and stuff like that?" She goes, "Yeah." I said, "People get paid for this? There's a market for this?" They're like, "Yeah." I said, "Well, I can do this!" I kept telling them, "I can do this." And they were like, "Well, it's very hard to get in, you have to study, and it's this very tight circle of people who do it." And I basically said, "Look, guys, just send me out." And I literally did this for about a year. I guess to shut me up, they sent me out. One of the first things they sent me out, I got -- and it just snowballed from there. WHIT SPURGEON: Did you read comics as a kid? RICHARDSON: Oh Yeah! Heck, yeah! WHIT SPURGEON: Do you still read them? RICHARDSON: Only if I'm at a buddy's house who has them. WHIT SPURGEON: What were your favorites? RICHARDSON: Spider-Man, Incredible Hulk, and I kind of was getting into the Uncanny X-Men a little bit. But the Hulk and Spider-Man were definitely my favorites. Fantastic Four was kind of cool. But... Spidey, Hulk. WHIT SPURGEON: In a ballroom dancing contest, who would win? The Hulk or Superman? RICHARDSON: I don't think there would be much of a ballroom dance floor after he stopped! [laughter] Superman's lighter on his feet. WHIT SPURGEON: In a contest of eating canned hams, who would win? WHIT SPURGEON: I'm looking at the breadth of your credits. You played Nick Fury. RICHARDSON: I think I did, you're right, Young Nick Fury. WHIT SPURGEON: You have been on The Marvelous Misadventures of Flapjack. God bless you for being on Flapjack, I think it's the weirdest childrens' cartoon ever. WHIT SPURGEON: You played Barney Rubble on Harvey Birdman. You've played the Joker, Darkseid. RICHARDSON: Ah, I loved it. WHIT SPURGEON: You're perfect for Darkseid. RICHARDSON: Yeah, you're right. It was like a little short stint, a good friend did it before me. But I do remember that, yes. 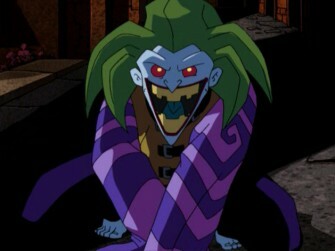 The Joker, I loved playing the Joker. WHIT SPURGEON: Here's one that jumped out at me. Porco Rosso. You did some of the American voiceover work for that? RICHARDSON: Yes. You know, I still haven't seen it. WHIT SPURGEON: You've still never seen it? 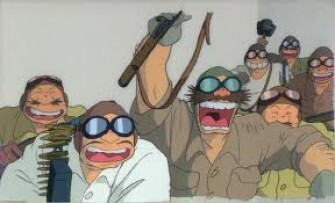 You've done a Miyazaki film! That's like the crowning achievement in the world of animation. RICHARDSON: Everybody tells me that! WHIT SPURGEON: Now given the number of voiceover gigs you've done... which voices do you prefer? Do you prefer the original characters that you create from the ground up? Or would your rather work on established characters, no matter if they bring a certain degree of expectation or baggage with them? For instance, when you're playing the Joker, do you feel the weight of what fans think the Joker should sound like? RICHARDSON: With the Joker, I really worked on that. I tried to make it my original take on him as much as possible. With the help... I mean, do you think I was doing somebody else, or was it original? Honestly. WHIT SPURGEON: Honestly, I thought it was very original. I guess the question is, do you ever feel that pressure? When you're playing someone like Nick Fury or something, are you thinking, "Oh boy, all these Nick Fury fans..."
RICHARDSON: Sometimes once in awhile you do, you're like, "OK, what do they expect me to do?" But I just come up with it naturally, and most of the time they seem very happy with that. I like the characters that are more organic. The ones you've got kind of step in and do what they want, or exact sound-alikes, it takes away from the originality and what you want to bring to the character. I'd much rather do characters that I helped create. But it's cool. Hey, if you wanna pay me, fine. WHIT SPURGEON: Do you have a preference for comedy or dramatic voiceover work? RICHARDSON: Comedy's a lot more fun. But wait a second now... What would you call The Batman? WHIT SPURGEON: It's more drama than comedy. There are comedy elements to it. RICHARDSON: It was a lot of fun playing the Joker, because it was highs and lows, and because of his insanity. It was fun playing him. Comedy? I love doing it because I'm making people laugh. But drama? I love the intensity and freaking people out. Especially whenever I recorded the Joker. That was just... I got a kick out of that. Because these people would look over at me, look at me during the recording, you know, the executives and the other cast members, you know, you see this 300-pound brother doing this like, voice of the Joker and, like, getting all insane and crazy... I could see in their eyes that a couple of them were really freakin' scared (laughs) and freaked out! And you know what? I kinda liked it! [laughter] You know, not that I was gonna do anything, but it was cool. WHIT SPURGEON: Is there any comics character that you haven't played yet, vocally, that you'd love to get your teeth into? RICHARDSON: I haven't thought about that. Right at the moment? Vic Stone -- Cyborg -- I always wanted to play Cyborg. Anybody else? Power Man: Luke Cage, Hero for Hire. And Shaft. If they ever do the animated Shaft, I would like to do that. And sing the main theme. Whit Spurgeon is a writer, actor and photographer living in Los Angeles.